And who has said it’s Beard ? Pearl will always be second at Auburn to Saturday’s in Autumn.. Some people are cool with being #2. Pearl was 2nd fiddle to Summitt at UT. Brey is 2nd fiddle to The Purple Menace in South Bend. It's okay to be #2. Beard would be a home run for UCLA. Much better than Dixon. Watching live, it looked to me that the defender caused the ball handler to lose his dribble, to me. Replay proved otherwise. 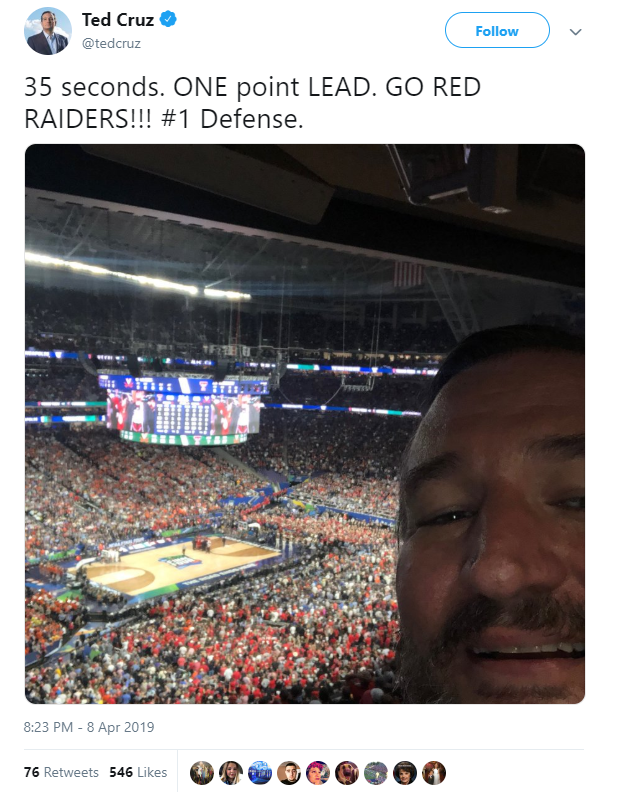 Texas Tech is going to a national championship game in any sport. What a time to be alive. UVA 35 Tech 30 final score. Kelce with the Coors Light Orale!!!! The offense in Monday's title game could be worse than The Maryland-Indiana game in '02 without the Juan Dixon. Rick Barnes leader in the clubhouse. Rick Barnes needs a raise after reaching the second weekend of the tournament this year for the first time since 2008. DONE DEAL and PRESS CONFERENCE CORCH in one tweet! My cable and internet are out I assume I’m not missing much. Could go back to the bar I watched final 4 at and see if markuse pouncey shows up again. He drinks jack and coke. New dc for bengals sat next to me for awhile too. TTU has eclipsed their 24-point pace and we are still in the first half!! I do not understand how Texas Tech scores points. if TTU wins this is the most random college footbaw or basketball shampship of ma'lifetime. man i want to root for uva but why they gotta be so douchy? TTU gonna get blown out. Culver is a lottery pick? Nah b. Neither of these teams have much off the ball movement on offense. It's not fun to watch. Cable back on in time for me to see Million Dollar Man Ted Odiase's grandson with a chance to tie it. Culver does the same thing from the elbow all night, but then, PLOT TWIST with the lefty finish! Culver nice jacking it up for 3 when its tied. Hope you go pro in the NBA man, cuz you aren't being trusted to upsell at my branch. so why doesn't kid genius beard call a timeout with 10 seconds and draw up a brilliant play? because i'd rather let my mental midget's catch the other guys mental midgets off guard? This made it all better. PWNT. Midnight end for a college basketball game? Won't anyone think of the chillren?